Integrate math, art and science all in one craft! 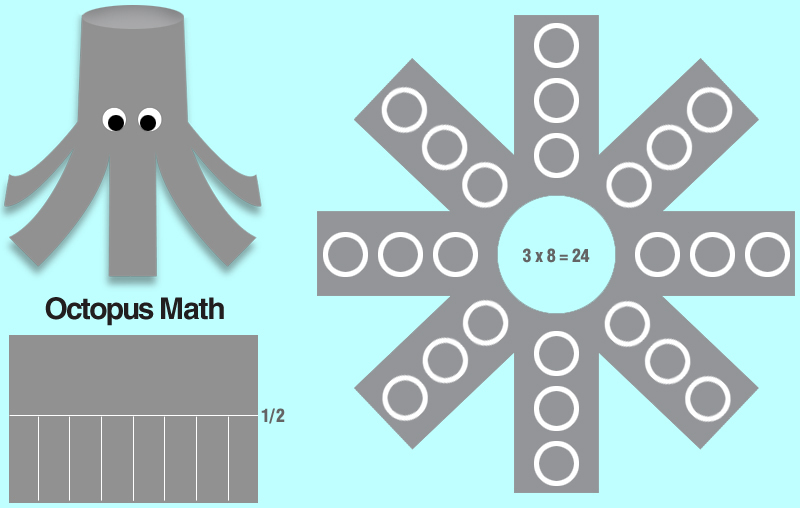 Kids create an octopus, while exploring division, fractions, and multiplication! First, they divide a piece of construction paper in half. Next, they use a ruler and draw lines (on half the sheet) to create eight rectangles for the arms (see image). They cut along the lines they drew, stopping at the halfway mark. Then, they curve the paper and staple. Once stapled, they bend the arms, so the octopus can sit up. After they created their octopus shape, they flip it over. They stick round reinforcement labels (white circle stickers with a hole in the center) on the back of its arms and create suction cup arrays! (see image) Then, they figure out the multiplication equation for their octopus.